Home » PET INDUSTRY » What Are Pet Stores Doing to Better Compete with Online Retailers? It’s no secret that competition from online retailers has posed a major challenge to pet stores over the past several years. In fact, nearly 70 percent of brick-and-mortar pet retailers surveyed by Pet Business pointed to internet outlets as their most dangerous competitors in the marketplace. However, the owners and operators of traditional pet stores are determined to fight back and are using a variety of weapons in their arsenal to repel the increasing encroachment of web-based retailers. What are you doing to better compete with online retailers? 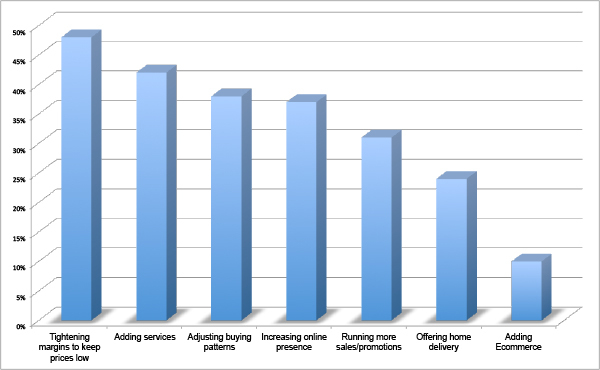 While brick-and-mortar retailers typically do not want to engage in a price war with their online competitors, as you can see in the chart above, nearly 50 percent of survey respondents said that they have been tightening margins and another 30 percent reported that they have been running more sales and promotions in order to stay price competitive. However, the goal in both cases is not usually to drive pricing below what consumers can find on the web, but rather to stay in the ballpark so that shoppers do not view traditional pet stores as price gougers. Still, competing on price is not an appealing proposition when most brick-and-mortar retailers are already working with razor-thin margins—particularly in the food category. That is why more than a third of survey respondents indicated that they have been adjusting their buying patterns to favor vendors and brands that either do not sell through online retailers like Chewy and Amazon or keep tight control over retail pricing on the internet. Not surprisingly, adding services that cannot be duplicated online is another important way that traditional pet stores are drawing shoppers into their aisles. More than 40 percent of brick-and-mortar retailers who participated in the Pet Business survey reported that they have brought in offerings such as full-service grooming, DIY bathing, pet boarding and training services to not only increase customer traffic, but also diversify their revenue streams. Finally, increasing their stores’ visibility on the internet, offering home delivery and even adding an ecommerce component are all ways that pet retailers are fighting fire with fire when it comes to competing with web-based outlets. But given that less than 25 percent of survey respondents said they provide delivery services and not even 10 percent indicated that they participate in ecommerce, it is clear that pet stores would prefer to leverage their traditional strengths, rather than emulate online competitors. That, of course, includes the No. 1 write-in response Pet Business received from survey respondents when we asked what they were doing to better compete with online retailers—providing a high level of customer service. I guess some things never change; and in this case, that is great news.